International Nutrition marks new beginning in early June with grand opening of new production facility. Tragedy unexpectedly struck at the International Nutrition facility in south-central Omaha, Neb., in January 2014. Two were killed and nine injured when a section of the company’s long-standing production facility collapsed. This past month, the company honored those lost with a plaque to be installed in a new 20,000 sq. ft. production building on the site of where the old once stood. Now operational and adding back additional capacity as required approvals and inspections are completed, it is one of the most modern premix facilities in the nation. International Nutrition is a privately held company involved in the production of livestock feed products and animal supplements and premixes. Its properties encompass five buildings on a 150,000 sq. ft. campus near 76th St. and F St. in Omaha. The corporate office is located about 50 yards from where the production facility sits. Steven Silver, president of International Nutrition, said in a recent interview that the new production facility is very different from the old structure, which was built in the early 1970s. 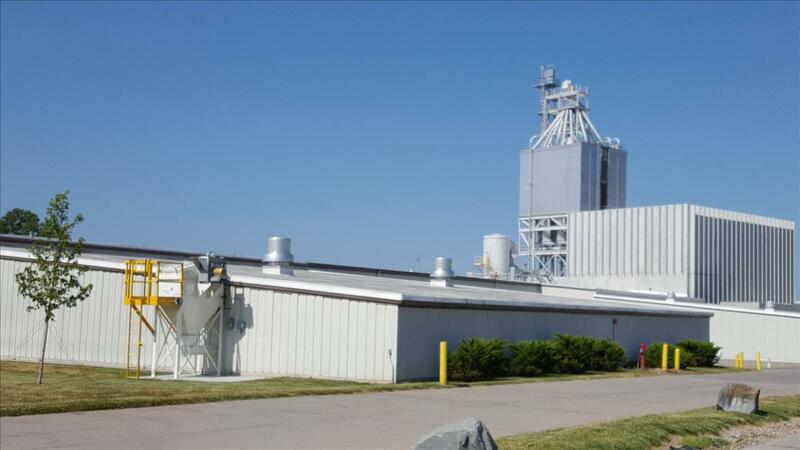 The new three-story pre-cast concrete structure, built by Younglove Construction of Sioux City, Iowa, houses the latest in mixing equipment and safety features. Four mild steel mixers with a capacity of five metric tons are located in the primary mixing area. Nineteen bulk bins, located behind the building, empty directly into these mixers that rest on individual load sensors. Process automation is controlled through a CPM/Beta Raven system. In a separate climate-controlled room are two, 2 mt stainless steel mixers for manufacturing water-soluble products and doing form fill seal packaging. An explosion-suppression system has been installed, and areas where dust traditionally tends to accumulate have been minimized. A plant-wide dust collection system allows for dust to be vacuumed up rather than blown around, as would be the case when areas are cleaned with streams of air. Silver said he was overwhelmed by and so appreciative of the response by customers and suppliers to the 2014 incident. While International Nutrition is involved in more than just the production business and was able to continue certain distribution and production functions, Silver said outsourced production support from customers and others currently in the premix business, continued direct relationships with suppliers and ongoing commitments from customers across the globe allowed the company to fully operate. Without this level of support, Silver said the company would never have been able to rebuild. When asked about the challenges ahead, Silver said, without question, animal agriculture faces increased regulatory pressure to operate at a level more in line with that of the human food industry, and this new facility, run by well-trained and dedicated employees, is designed to specifically help International Nutrition's customers meet those standards. “There’s a lot of production capacity out there, but it’s all 40-70 years old, ... and this new plant takes us and the industry into the future,” Silver said.